Stress has been suspected to play a role in rhinitis. The role of stress on nasal patency has been not yet elucidated. The aim was to evaluate the potential effects of stress on nasal patency in healthy subjects. We conducted a prospective pilot study including 12 healthy subjects. Experimental protocol was divided in three periods (pre-task, task and recovery). In the task period, subjects were exposed to the “Trier Social Stress Test” (TSST), a standardized laboratory stressor. 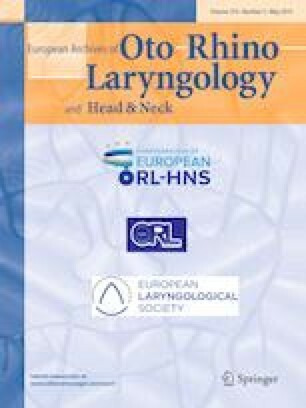 Different parameters including Spielberger State Anxiety Inventory (SSAI) score, visual analogic scale (VAS) of nasal patency feeling, heart rate, acoustic rhinometry measurements have been compared between the three different periods. The study population was divided into two groups according to the Spielberger Trait Anxiety Inventory (STAI) score: A “non anxious” group and a “weakly anxious” group. Seven subjects were in the “non anxious” group and five in the “weakly anxious” group. TSST significantly increased heart rate in all volunteers. SSAI score was significantly increased (p = 0.04) after the task period (36.6 ± 11.3) when compared to the SSAI score in pre-task period (31.9 ± 12.6). VAS score of nasal patency feeling significantly decreased from pre-task to task and recovery periods. Mean minimal cross-sectional areas and mean volumes of the nasal cavities were not significantly different between the three periods, except in “weakly anxious” group, but the small number of subjects does not allow to draw a definite conclusion. We observed that stress influenced the feeling of nasal patency in healthy subjects. However, the objective effects of stress on nasal geometry were globally non-significant except in “weakly anxious” group. This latter result of our pilot study needs to be confirmed in a larger cohort. Heloïse De Kermadec and Emilie Bequignon First co-author, equally contributed to this manuscript. The authors deeply thank Felicity Nielson for careful rereading of the manuscript. This study was not sponsored by any external financial support. All authors have no conflict of interest in connection to this study. All procedures performed in studies involving human participants were in accordance with the ethical standards of the national research committee and with the 1964 Helsinki declaration and its later amendments or comparable ethical standards. The experimental protocol was approved by the local research ethics committee (IRB). Experimental protocol was approved by the local research ethics committee (IRB).